Body Wrap (9" x 29", shown rolled up) and Eye Pillow can provide soothing comfort to tired or sore muscles. Use warmed or chilled. Helps with relaxation, sleeping, headaches. Especially welcome "get well" gifts, for birthdays or other special occasions. 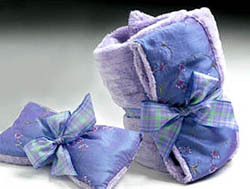 Available in a selection of fabrics with either lavender, eucalyptus, frankincense & myrrh or unscented. Imported from Europe, this 12" diam. 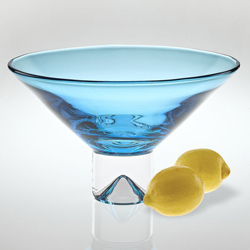 lead crystal centerpiece combines both colored and clear crystal in an elegant, contemporary design. Inverted pyramid in pedestal base mimics the shape of the bowl. Shown in aqua. Now available in amber, red, violet or clear only. 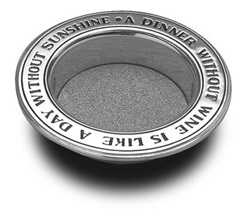 Inscribed with the message: "A Dinner Without Wine Is Like A Day Without Sunshine". The "Swiss" design shown is a wedge-shaped board, made of eco-friendly rubberwood--a hardwood known for it rich grain and durability-- with bamboo inlays depicting the holes Swiss cheese is known for. 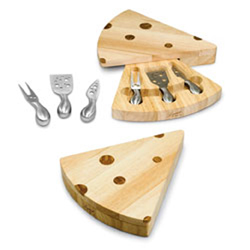 The 10" x 11.5" x 1.9" cheese board swivels open to reveal three brushed stainless steel cheese tools with "Swiss cheese" holes on the face of each tool. Many other designs are available at varying price points. $35.00 Can be laser engraved with your company logo at modest additional cost (12 pc. minimum).